Hello, i am trying to build a cutting plotter. I found a old printer, which i modified (added stepper motors to be simillar as 3D printer) to hold the cutting blade and be able to move it. I use Marlin firmware, because its the only one, i am a little bit familiar with. My problem is, that if i try to cut something (G-code is generated by Inkscape plugin) it looks perfect in preview, however if i cut it, the first Y line it cut looks OK, but the second have shifted Y axis by about 1 mm. And it is getting worse with every other "Y line" - as shown in the picture. The blue line is what i want to cut and the red line is what i get. My problem is - why is this "shifting" happening? I tried removing the blade - so it wont drag the paper. I tried different settings, slower movement, different acceleration, jerk in marlin settings. At first, i thought it might be because of the wrong steps/mm, but it is not. If anybody could help me, i would be wery gratefull. Is your y-axis perpendicular to your x-axis? Be sure your y-rails are at a right angle to the x-rails. Another possibility is that you have a loose belt under the bed on the y-axis; a slipping belt could cause incremental drift. Y axis is not driven by belt, but by gear - as it is on most ink printers i have seen. I just removed the shaft from original gear and inserted stepper´s shaft - the connection is pretty solid. Today i did some experimenting with it and it looks like, its because of the gears, but i dont underestand why. There is no backlash on the gears, but is seems that they dont move as they should (i draw a line on them and rolled 200 mm to + and then - , and it didnt match). I thought it might be wrong stepper, but a new one is doing the same. I guess i will have to remove all gears and mount the stepper directly to the shaft of rollers, that move paper. 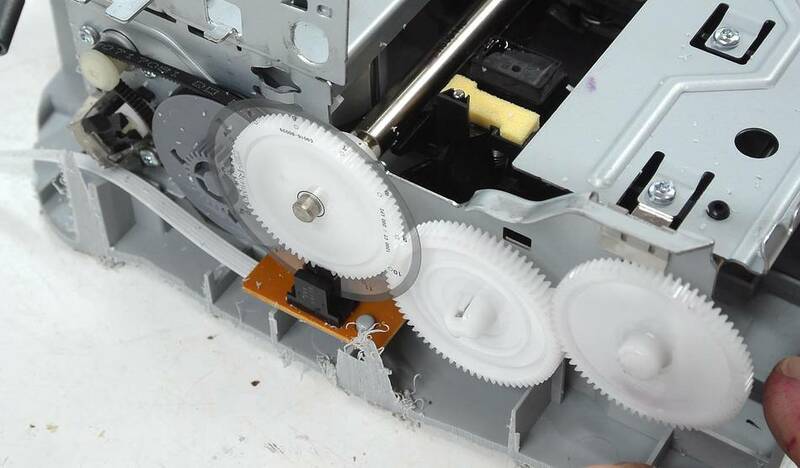 If you are interested on this link ( https://woodgears.ca/tech/printer.html ) is almost the same printer i got and in this picture ( https://woodgears.ca/tech/printer26-b.jpg ) you can see the gears. In my case the middle one is driven by stepper (and it turns other two). To the axis angle - if i try to cut straight line along X axis (the shorter side of the paper) it is perfect. Problem is, when i move Y axis (longer side of the paper) back and forth - it doesntg move to the same spot. And from what i can tell it is not problem of slipping paper (it is holding really strongly). Didn't really expect to stumble across Matthias on the context of a 3dprinting Forum . He's in woodworking what Tom is in 3d printing. A didn´t even notice that . So i tried to mount stepper dirrectly to the shaft that moves paper. It change nothing - even if i rotate the shaft the by the same degree and then go back, it doesnt move the paper by the same length. I have no idea why. If i try to move paper with enabled stepper its almost impossible, if i try to speed it up while moving it is also very hard. But somehow the paper is faster when moving forward than backwards. I have even tried completely different board and software (GRBL + CNC shield + Arduino UNO). I guess i will have to start on some different printer or do it from scratch. Just curious, are you using the rubber roller(s) to move the paper? My experience has been that a spot of grease or any slight misalignment will cause paper to move diagonally. Yes, i am using the rubber rollers from the printer. I have even tried to clean them. They are in the same positioin, as they were in new printer so i dont think it should be problem. The paper is moving straight as far as i can tell - for sure not so much diagonally to cause what it is doing. Dont you have some simple way how to "move" the paper? I am going to disassembly it completelly and try to build it on some wood and 3D print everything and try to find some better way to move the paper.